The Tefal Actifry electric fryer is a counter top low fat healthy cooker making use of the patented hot air system and its stirring paddle for even cooking. Hot circulating air pulses around the food and the paddle gently stirs it. The T fal hot air fryer is a hands-free way to deep fry your food without oil. Now, how is that even possible. The review below will reveal to you the secret behind healthy fried food without using oil or at the most, just a tablespoonful. 1.4.1 T-fal Actifry Low Fat Multi-Cooker – What can you cook in it? 5.1 What are the benefits of the Tefal Actifry multi cooker? Tefal has come up with different models for different markets. The earliest Tefal Actifry USA (T-fal FZ7002 ActiFry) comes with a 2.2 pounds cooking capacity, 110V and 1400 wattage. The latest Actifry original model is FZ710851. The Tefal Actifry reviews online seem to be mostly positive where taste and texture of the cooked food is concerned. These complaints seem to be mostly from the UK Amazon customers using the older model which was first launched in 2007. Tefal has since released newer upgraded models and judging from the recent reviews, most are positive. Made in France, there is no mention of black smoke and flames in the newer models. Another common complaint seems to be the quality of its paddle and removable parts. A few users commented that these parts broke up before a year’s usage is up. The upgraded model has a better click and lock design for the paddle compared to the older weaker clipping on design. The inclusion of the stirring paddle does mean that certain stir-fry dishes are possible in the T fal Airfryer. 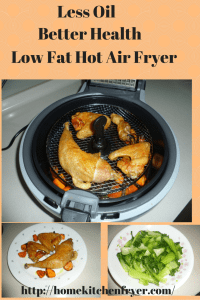 Design wise, the Tefal hot air fryer has a low height compared to the Philips airfryer, 8.27″H for the Tefal FZ710 compared to the 15.1″ for the Philips. This makes it more suitable when you have a low counter height between kitchen cabinets and counter top. The Tefal FZ710 Actifry hot air deep fryer comes with a 2.2 pounds (1 kg) capacity non-stick ceramic bowl. The included paddle helps in stirring the food, preventing them from sticking together. The see-through steam-free lid is a nice feature as you get to peep at the food cooking inside the air fryer. At time of writing, Tefal Actifry 2 in 1 as well as the Actifry with snacking basket is available in Asia and Europe only. Both of these come with a second layer of cooking surface which greatly increases the cooking capabilities of the basic classic model. The 2 in 1 also has a larger cooking capacity at 3.3 pounds. The wire snacking basket can be fitted onto the basic original model and comes highly recommended. The snacking basket is very useful and comes highly recommended. You put this on top of the ceramic bowl without the stirring paddle. 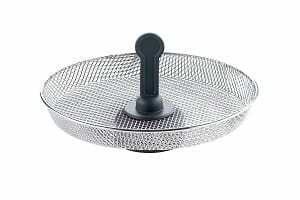 You can use it to cook delicate items such as fish fillets, spring rolls etc. The stirring paddle is not suitable for use with delicate food ingredients or bigger cuts of food items such as a whole piece of drumstick. Cooking the drumstick using the snacking wire tray also has the additional benefit of more oil dripping out from the meat onto the round ceramic bowl below. You get a piece of truly low fat chicken drumstick. Homemade French fries using just 1 tablespoonful of healthy oil is certainly noteworthy, especially when the fries pass the crispy outside moist inside test. However, it would certainly not be economical to get the Actifry hot air cooker just to cook your French fries even if you ate them on a daily basis. 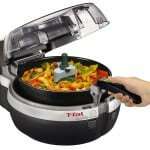 T-fal Actifry Low Fat Multi-Cooker – What can you cook in it? This Tefal hot air fryer certainly does more than that. You can fry vegetables, cook meat dishes, roast chicken, meat patties, frozen varieties and even fruits. Roasting nuts turn out great. The stirring paddle prevents the situation where some nuts come out burnt while some are under cooked. I find it easier to roast nuts in the air fryer than in the oven. Food with liquid such as soup is not recommended. This is because the rim of the cooking pan around the paddle is low. Too much liquid will result in some overflowing into the motor area. The Tefal hot air cooker is simple to operate. There is an on/off button and a 99 minutes digital LED timer with a buzzer that beeps when the countdown timer reaches zero. However, the power will not stop and the fryer will not shut down. You have to manually shut off the power. This is a bit of a disadvantage as there is the risk of overcooking and overheating if you set and forget the whole thing. On top of that the beeping noise made by the buzzer is not that loud and almost drown out by the noise of the motor. There is no temperature control as the temperature remains constant at 338 degrees Fahrenheit. This is a bit of a disadvantage too as different food cooks best at different temperatures. Besides, you can’t raise the temperature to shorten the cooking time. However, this can turn out to be an advantage too as you do not have to worry about adjusting the correct temperature for the food you are cooking. Check out the MyActifry mobile app for more Actifry recipe suggestions. It is simple to use. Season the food, open the lid, put them on the rotating pan, set the timer and switch on the power. The rest of the cooking process will be done by the Actifry. No preheating is needed. Cooking times vary depending on the food and amount. 2 pounds of fresh French fries will come out crispy in about 35 – 45 minutes, with 1 tablespoon of oil added. This is about 4 portions of fries. Frozen fries will take only 20 – 25 minutes and addition of oil is not necessary. I’ve tried arrowroot chips and they turn out great, crispy and tasty. Tasty chicken drumettes need about 20 to 25 minutes. Finish off by adding a sauce to coat your chicken and cook for another 3 minutes. Any food that is stir-fried in a Chinese wok can also be cooked in the air fryer with the paddle stirring the food. Just make sure the ingredients are cut into uniformed small sizes so that they cook evenly. Those that need a longer cooking time go in first. You can stop the fryer by pressing on the release lid button, add in the rest of the ingredients, close back the lid and continue cooking. When the lid is opened, the machine stops and starts again when the lid is closed back. Frying green vegetables with hardy stems such as Chinese bok choy is possible. Vegetables such as spinach might turn out too limb and soft. Bok choy needs about 8 – 10 minutes of cooking time. The bok choy turns out just like stir-frying in the wok, green and crunchy. Successful wok cooking depends on the high heat and quick stirring with the wok ladle. Same principle applies to the Actifry FZ7002 hot air multi cooker. Frozen breaded food can be cooked in the Actifry but not those homemade food with wet batter coating. The paddle will make a mess of everything. It is also not advisable to cook without the paddle as food crumbs might drop into the motor unit. However, if you have the Tefal Actifry with the snacking basket or the 2 in 1 model with an extra cooking pan, then you can still cook batter coated fish in the bottom non-stick pan, with the snacking basket or second pan on top cooking another type of food. In this case, there is no paddle to break up the delicate fish. The downside though, you have to stop halfway and turn the fish slices for a more even cooking. Yes, it is possible to cook a complete lunch or dinner with just the Tefal Actifry healthy fryer. Dinner can be ready in under 30 minutes with minimum mess to clean up. However, food preparation time is still needed. The cooking process pauses when lid is opened to add in seasoning or additional ingredients. It continues when lid is closed back. Cleaning up is easy. 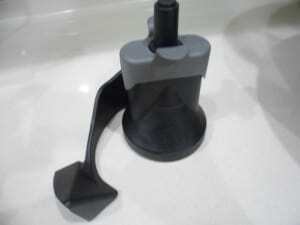 The paddle, lid, pan and filter can be removed for cleaning. All removable parts are dishwasher safe. Wipe the interior base and outer body with a damp cloth. The outer material is plastic and the removable cooking bowl or pan is nonstick ceramic coated. It is free of PTFE and PFOA, the toxic material found in much earlier versions of Teflon. 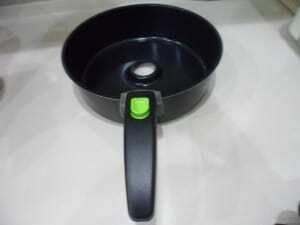 The handle of the pan can be easily folded down when not in use by pushing the green button on the handle. It comes with a removable transparent steam-free lid. Lid is removed from main body by pressing down a lever. It clicks back onto the machine using a rather small (a bit flimsy looking) hinge. It is easy to put back in, there will be a clicking sound. However, care has to be taken due to the rather tiny looking hinge. It is also advisable not to bang shut the lid as the lid clicks shut using clips. Delicate hinges and clips need tender loving care. There is a hard plastic paddle for stirring the food in the pan. You have to make sure you push in the paddle to lock it into the machine properly before starting. There will be a clicking sound. When not properly pushed in, paddle might break during cooking. It is also not recommended to cook without the paddle as food and oil vapor can drop into the motor unit. The fryer comes with a non-retractable cord. There is a recipe booklet included. 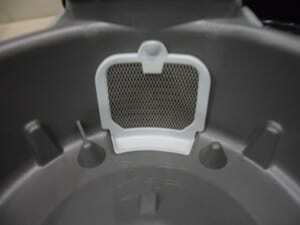 There is a small odorless wire mesh filter at the part where the air exits the air vents. This air filter is dishwasher safe. However, it is very easy to wash by hand which is what I normally do. You do get proper fried chips instead of oven baked ones. If you compare them to those fried in a deep fryer, I would say almost the same but much less greasy. You do have to cut the chips thin for them to be crispy though. The deep fryer cooks faster compared to the 30 to 45 minutes for a pound of fries in the Tefal air fryer. You do get crispy chicken wings fried using the oil from its skin when using the Tefal Actifry. However, you can’t really compared the crunch of the breaded chicken wing fried in the deep fryer. You can’t cook breaded stuff in the Actifry as the paddle will break up the outer layer of batter. There is definitely no greasy oil smell all over the house as minimal oil is used inside the enclosed air fryer. Cleaning up is way easier with the airfryer as compared to the deep fryer. 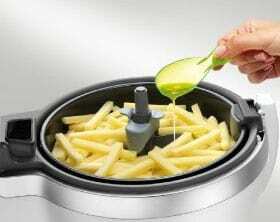 There is no oil wastage using the Actifry hot air food fryer as minimal oil is used. As for the deep fryer, you have excess used oil to store. The convection oven uses hot air to cook food just like the Actifry hot air cooker. You can use minimal oil and food turns out crispy and moist too. Taste is a very personal matter, some might find it slightly better than the Actifry and some might prefer those done in the air fryer. As for me, I prefer the non-greasy aftertaste offered by the airfryer. It is easier to control the cooking in the airfryer. Food doesn’t turn out burnt or dried out which can happen in the oven, especially when roasting nuts. The air fryer wins hands down in this case. When you’re cooking in small portions, say for one person, then it is more practical to use the airfryer. No heating up is required and the small portion of food cooks faster in the smaller cooking capacity of the hot air fryer. As for the price, there are some oven more expensive than the T fal health cooker with some cheaper ones too. Tefal air fryer has a slightly larger capacity at 2.2 pounds compared to the 1.8 pounds of the Philips hot air fryer. With Philips, you can set the temperature from 180 – 390 degrees F. The Tefal fryer has a constant temperature set at 338 degrees F.
With Tefal, you do not have to stop the cooking halfway to shake the food in the basket as is needed in the Philips hot airfryer. Instead, the Tefal hot air fryer has a paddle to constantly stir the food in the pan. The Philips models will auto shut-off when timer reaches zero and cooking is completed. This is not true for the Tefal brand (the FZ7002 Tefal Actifry). You have to manually turn off the power. However, other models in the Tefal brand such as the Tefal Actifry Family does come with the auto shut down once cooking is completed. These models have yet to arrive in the US though. Will update the post once available in USA. What are the benefits of the Tefal Actifry multi cooker? After reading through the numerous reviews and my own experience with my Actifry, I would say that it does indeed offers a healthier way to cook. Compared to a traditional deep fryer, there is 70 to 80 % less oil in your food. In fact, a 2 pounds batch of homemade French fries only contain about 3% fat. Fuss free cooking, that’s what the T fal Actifry cooker offers. This might not be the kitchen appliance for everyone, especially when you already owns a convection oven or don’t really like fried food. This would most likely appeal to those who love fried food but not the oil that comes with it. Busy mums, office workers, college students or singles who do not have much time for cooking, not to mention the hassle of cleaning up the kitchen mess later. 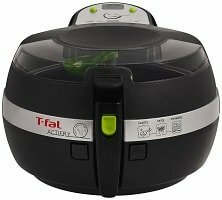 When you’re in a rush, then you’ll really appreciate the T Fal Actifry low fat fryer. Those who do not really have a passion for cooking but still needs to cook, will no doubt love this hassle free Tefal low fat healthy fryer. It simplifies the whole cooking process without having to worry about undercooked, overcooked or burnt food. On top of that, all the removable parts are dishwasher safe. Whether you should buy the T fal airfryer or give it a skip depends on your needs. It does produce results as promised. If you’re expecting it to replace your other cooking pots and pans, slow cookers or wok and skillet, then you’ll be disappointed. Homemade freshly breaded food might not turn out to your expectations. Stews are best cooked using slow cookers. You’ll still need a pot to cook your soup. A bit of trial and error and experimenting with the timing will produce good results. You need some time to adjust to this kind of cooking. Most people seem to adapt well and really like the taste but there are some that didn’t. Some people probably aren’t going to ever like the slight taste difference. That’s just how taste buds work, I would think.